Thanksgiving is more than a single day out of the year. It’s a season full of memories and traditions. Pumpkin pie, spending time with relatives you haven’t seen in ages, football games, Thanksgiving Day parades. For some, it’s the time of year when the Christmas decorations come out. Others can’t wait until Black Friday to snag a good deal. And still others look forward to that long food-coma-nap in the recliner. One of my most treasured Thanksgiving traditions and memories is that of doing Thankfulness Leaves each year with my husband and sons. I was trying to determine when, exactly, we started this tradition, but I simply can’t. I have photographic evidence going back to at least 2004, but after that, it gets hazy. Still, 13+ years makes for a pretty solid tradition. Every year, I cut leaves out of autumn-colored card stock or construction paper. For as long as I can remember, I’ve cut out five leaves for each person. If I’m on top of things, I do this a week or so before Thanksgiving, and if not…well, it’s a little later. 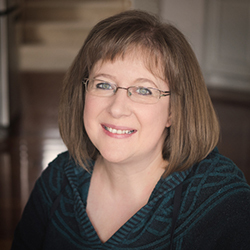 Then, during the days leading up to Thanksgiving, we spend some time gathering together after dinner to reflect on our blessings, to write things we’re thankful for on the leaves, and to pray together, thanking God for how He cares for us. Some years, we do this on each of the five days leading up to Thanksgiving, filling out one leaf per evening. Some years, we compress it a bit, or even do all of the leaves the day before Thanksgiving or on the holiday itself. It all depends on what we have going on and when we are all in town / available. After our time of prayer, we put the leaves up in their designated spot, where they will live until at least Christmas, reminding us of the many ways in which we are blessed, and reminding us to make gratitude a priority. And what is this “designated spot”? It’s been different in each house for us, and can even change from year to year. It’s been on a fireplace surround, over a mantel, on glass doors to the den, or even on a blank wall. 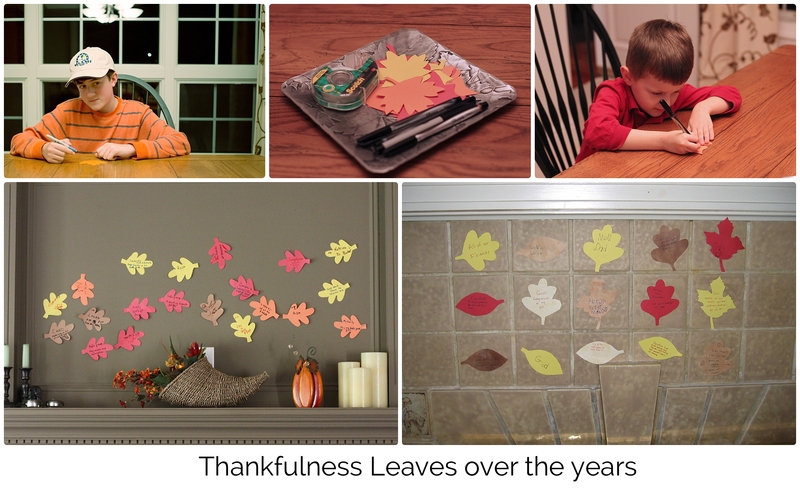 All you need is a spot where you can tape (or tack in some way) the leaves so that they are there for all to see. And as we’ve watched both kids grow and mature over the years, we’ve seen how their written blessings changed as well. What a treasure it is to see their faith deepen, and to witness their understanding of blessings and joy transform over the years. There have been years when, quite honestly, I wanted to complain about life’s difficulties when it came time to write on those simple leaves. But the leaves from those years (which now live in a memory box in the attic) are reminders of God’s faithfulness, and of the importance of being intentionally grateful despite my not-so-reliable emotions. This Thanksgiving, Cam(19) is coming home from his freshman year at college to celebrate with us. I know we might not have too many more years when all four of us are together for the days leading up to the holiday, so I’m treasuring these traditions a little extra these days, thankful for the moments we have. I was getting ready to work on our leaves for this year (look! I’m on top of things this year! ), and decided I would make a printable for anyone to download and use. 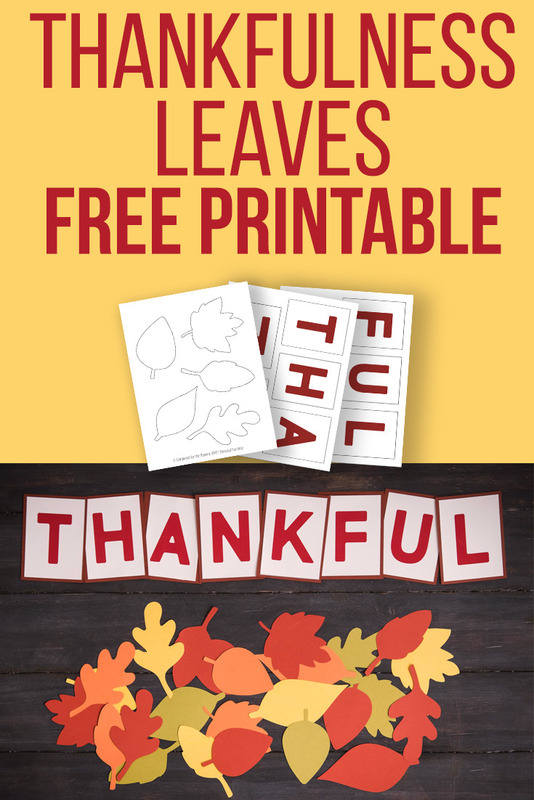 The downloadable pdf includes a sheet of leaf outlines, as well as the letters for THANKFUL that you can print out in order to create a banner — perfect for hanging over your designated spot. Personally, I recommend recruiting some help in cutting out the leaves (a great way to put your kids to work get the kids involved!). 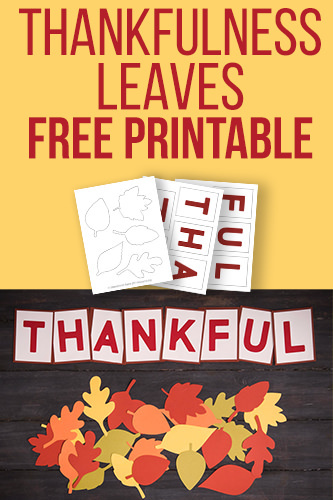 Just click the image or link below to download the Thankfulness Leaves pdf. I guess I didn’t know how you did this. I’ve seen the leaves, but not the lead up. I think it’s a wonderful idea. I like the idea of saving them, too. I’m sure God appreciates your idea and teaching that this does.